This lot features a vintage 1956 "The Creature Walks Among Us" original movie theater poster. This poster remains in nice condition as it has been stored flat and has not been folded only rolled. The Creature Walks Among Us is a 1956 American monster horror film and the third and final installment of the Creature from the Black Lagoon series from Universal Pictures, following the previous year's Revenge of the Creature. The film was directed by John Sherwood, the long-time Universal-International assistant director, in his directorial debut. Jack Arnold, who had directed the first two films in the series, had moved on to "A-list" films, and felt he had no more to contribute to the horror genre. He suggested that his assistant director, Sherwood, could move up to full director, which partly affected Universal's decision to allow him to direct the film. 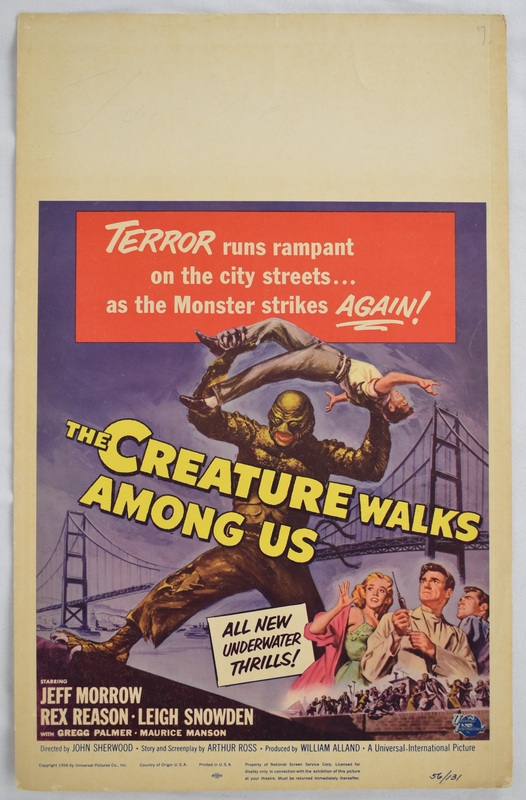 The Creature Walks Among Us starred Jeff Morrow, Rex Reason, and Leigh Snowden, and, like the original Creature from the Black Lagoon, had music composed by Henry Mancini, who at the time was under contract with Universal.